Dolphin. Photo by Susan Middleton, © 2003 California Academy of Sciences. The Cetacea are one of the most distinctive and highly specialized orders of mammals. They include the largest animal that has ever lived, the blue whale; the highly intelligent and communicative dolphins; the tusked narwhals and blind river dolphins and singing humpback whales  nearly eighty living species in all. Although hunting and other human activities have endangered most cetacean species, the outlook for many is improving. Whales are highly specialized for life in the water. Most species are marine, but dolphin species are found in the Yangtze, Amazon, Paraná, Indus and Ganges Rivers. Whales have streamlike bodies with highly compressed neck vertebrae, dorsal fins, and a tail with two finlike flukes arranged horizontally. Modern whales have greatly elongated anterior skull bones, and the nostrils are located on the top of the head, forming the blowhole. The forelimbs are specialized to form flippers, and the hind limbs and pelvis are extremely small and do not normally extend out of the body wall of the animal. 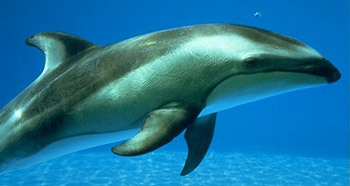 and porpoises are examples of odontocetes, as are belugas, narwhals, killer whales, sperm whales, and beaked whales. Baleen whales lack teeth completely as adults (although teeth are present in fetal baleen whales). They feed by straining small marine organisms out of the water using plates of baleen, a hornlike substance that forms filaments that hang down from the roof of the mouth. Blue, right, humpback, minke, gray, and fin whales are well-known examples of baleen whales. Some baleen whales, most famously the humpack whales, are known for the strange and complex songs they produce; their function is not clear, but unlike toothed whales, baleen whales do not use their songs for echolocation. The fossil record of whales is rich, and recent discoveries have shed much light on the origin of the Cetacea. The oldest fossil whales are often grouped together, largely for convenience, in a taxon known as the archaeocetes. Archaeocetes show several features that modern whales lack. Their teeth, like those of most land mammals, still show differentiation into several types. (Modern whales either lack teeth, or have teeth that are all virtually identical in shape and size). Archaeocetes also had nostrils near the tip of the nose, like land mammals, rather than a blowhole on the top of the head. Some retained substantial hind limbs that would have been visible outside the animal's body; in the earliest archaeocetes, these limbs and the pelvis were attached to the vertebrae by a sacral joint, but in later ones the limbs and pelvis were not attached to the rest of the skeleton. Pakicetus (right) is a Middle Eocene archaeocete from the Kuldana Formation of Pakistan; it is currently the earliest known well-preserved cetacean, and the archaeocete features are clearly visible in this replica skull from UCMP's collections. Pakicetus is so far known only from its skull, but recent finds in Pakistan have produced other whale species that show very primitive characters in both the skull and the rest of the skeleton. These animals had relatively well developed limbs, but were aquatic. Rodhocetus, a recently discovered archaeocete from Pakistan, was a few million years younger than Packicetus. Rodhocetus had well-developed hind limbs (although only the thighbone, or femur, has been preserved), but unlike land mammals, Rodhocetus did not have its vertebrae in the pelvic region fused together into a sacrum. Early whales such as Rodhocetus show many similarities with an early group of land mammals known as mesonychids, which are also close to the root of the hoofed mammals. In fact, some fossil teeth that were once identified as mesonychids are now known to have come from archaeocetes. By the late Eocene, archaeocete whales had spread to many parts of the world. Zygorhiza is fairly common in the Gulf Coastal region of the southeastern United States. 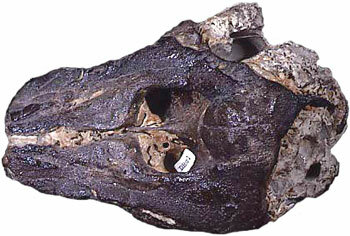 Although the body is very whale-like (though somewhat less compact than a modern whale), Zygorhiza shows differentiated teeth and nostrils near the end of the nose. Basilosaurus. Photo © Mark Uhen, Cranbrook Institute of Science. Basilosaurus (right) is another Eocene archaeocete from the Gulf Coast, with a rather unfortunate name: Dr. Richard Harlan, the 19th-century American physician who described and named it, believed it to be a giant reptile, and in 1843 named it "king lizard": Basilosaurus in Greek. Scientists who later examined Basilosaurus, notably Richard Owen, realized the error. Owen renamed the fossil Zeuglodon, meaning "yoked tooth"  a more appropriate description of the double-rooted molars of this animal. However, under the rules that govern naming species, the earliest name for a species has priority, even if that name is not an accurate description. Its name aside, Basilosaurus (skull at left) is significant because it is known to have retained small but well-developed hind limbs that projected from the body, although there was no joint between the pelvic bones and the vertebrae. Living whales retain only tiny splint-like bones as remnants of the pelvis and hind limbs. Basilosaurus has been found in Eocene rocks of the southeastern United States, notably in Alabama, Mississippi, and Louisiana  in fact it is the state fossil of Alabama, and the "state co-fossil" of Mississippi along with Zygorhiza. Basilosaurus has also been found in Eocene rocks of Australia and Egypt. By the late Oligocene, the two modern lineages of cetaceans had evolved from archaeocete ancestors. Interestingly, the late Oligocene whale Aetiocetus, from Oregon, has skull and jaw features typical of baleen whales, and is considered to be the earliest mysticete  yet it also bore a full set of teeth. By the Miocene, whales of both lineages are relatively common fossils in many marine deposits. A number of modern-day families of both toothed and baleen whales are known to have evolved by the late Miocene. These include the baleen whale families Balaenopteridae (rorqual whales, including the blue whale) and Balaenidae (right whales), and the toothed whale families Delphinidae (dolphins and killer whales), Physeteridae (sperm whales), Monodontidae (belugas and narwhals), Phocaenidae (porpoises), and Ziphiidae (beaked whales). Shown at right is the partial skull of a porpoise from the Miocene-age Monterey Formation, exposed at Duxbury Reef in Marin County, northern California. Researcher J.G.M. Thewissen has an excellent set of pages on the origin of whales, and fellow researcher Mark Uhen maintains another fine page on early whale fossils and evolution. Primitive Eocene Whales has information on archaeocetes from the southeastern United States. There is also a brief exhibit on fossil whales at the University of Oslo. Paleontologists might also visit the special exhibit on "Charlotte", a late Pleistocene fossil beluga whale from Vermont. For more information on living whales and where to see them, visit the Whale Watching Virtual Library, the Whale Conservation Institute, or the Cetacean Society International. An extensive species-by-species listing of WWW resources on whales and other marine mammals is also available as part of the Protected Marine Species project. And check out the work of UCMP scientists Healy Hamilton and Allen Collins on the evolution of river dolphins. Carroll, R.L. 1996. Patterns and Processes of Vertebrate Evolution. Cambridge University Press, Cambridge. Feldhamer, G.A., L.C. Drickamer, S.H. Vessey, and J.F. Merritt. 1999. Mammalogy: Adaptation, Diversity, and Ecology. McGraw-Hill, Boston. Gingerich, P.D., S.M. Raza, M. Arif, M. Anwar, and X. Zhou. 1994. New whale from the Eocene of Pakistan and the origin of cetacean swimming. Nature 368:844847. Slijper, E.J. 1979. Whales. 2nd ed. Cornell University Press, Ithaca, New York.